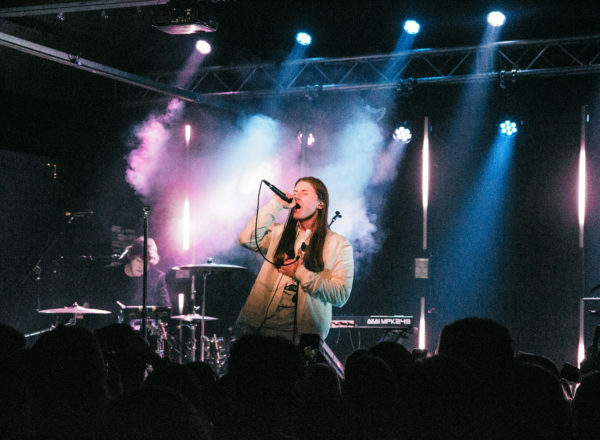 This past Tuesday, Bostonians alike received a sheer blast of perfectly blended instrumentals and vocals as Lostboycrow and company took over the Brighton Music Hall. His stop in Boston was part of his current nationwide “Spin The Globe Tour” supported by artist DYSN and duo group Prelow. With Brighton Music Hall being a music venue as well as a bar space, even the people who were there for just a drink no doubt liked what they heard. Starting it off was DYSN, a solo artist with just his voice and a guitar. Coming into the tour, DYSN had one song published on Spotify titled IRL, which actually features Prelow. Even with that being said, the song currently has racked up a whopping 756,795 plays and his time on stage reflected why he desired those plays. From the moment he got on stage with his guitar and a wooden stool to the moment he started to perform, I felt an almost Shawn Mendes like vibe. 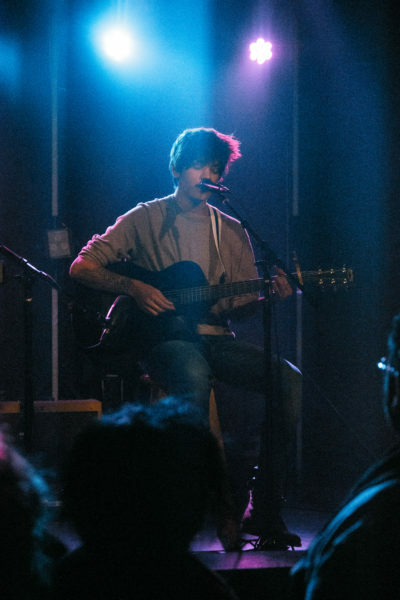 His ability to blend his guitar and vocals while positioning himself with the light gently shining on him helped to captivate the audience and kept them engaged. Also, due to the lack of music he had prepared, he entertained requests from the audience to help use up his stage time. Not only was this a good way to connect with the audience but it helped to show his range of artistic abilities. From this performance, it is safe to say we will be seeing more of DYSN in the future. Next up was Prelow, an Indie Pop duo who were ready to give Boston a show. With their time on stage, they used every resource available to them to please not only the ears but also the eyes. 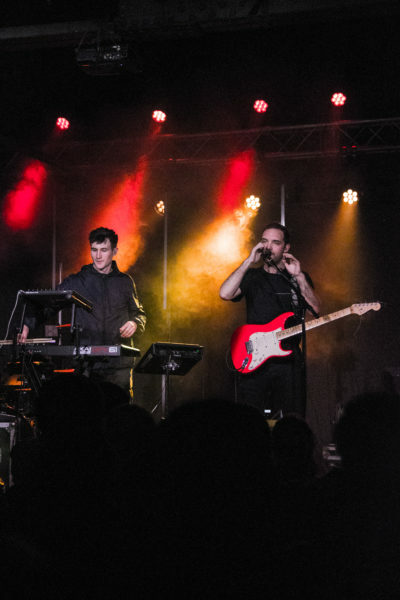 Despite being an opener with little say in the set design, their use of color and lights helped illuminate not only their music but also the venue. With every drum hit or guitar stroke, a new color or light would flash and add to the thrillful environment. 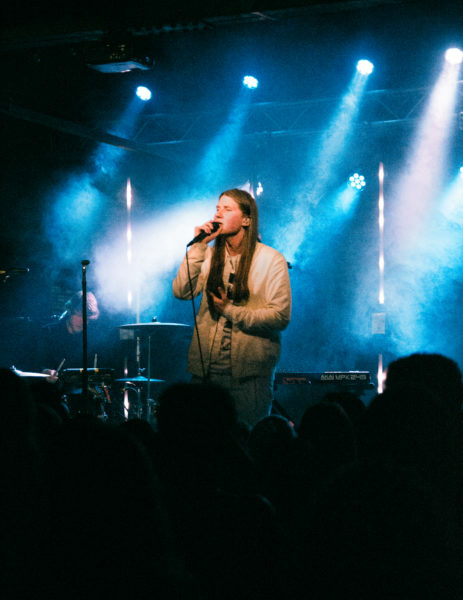 In contrast to DYSN’s ability to grab the audience and make them sway, Prelow had the ability to get the audience jumping with their hands in the air. Their mix of beats, vocals, and stage presence helped to create an amazing show for not just their fans in the audience, but for everyone. With their ability to use their musical talents and stage aura, they’ll be able to make an even bigger name for themselves. Last be definitely not least was the man of the hour, Lostboycrow. As a first time headliner in Boston, he truly controlled the show. When he took his first steps to join his guitarist and drummer on stage in his all-white attire, the energized crowd roared with excitement. Wasting no time, he got straight into his long-awaited performance with not only his music but also a colorful visual display. Every note played was accompanied by the neon colors from the previous dormant LED lights as well as the flash of the stage lights. Every word and every song performed was perfectly crafted to be reflected in the color on stage. The urge to sing along and get lost in the performance was inevitable. Lostboycrow’s performance not only wowed audience but brought the music to life. Fan or not, if you have the chance to see Lostboycrow live, definitely do.